Expose customers to prime advertising, right at their feet! 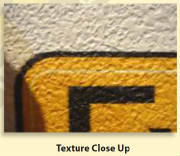 We produce durable, high quality printed floor graphics that feature a special non-slip coating. These are great for temporary in-store specials, directing foot traffic or drawing attention to a special promotion, event or product. Floor graphics are available in any shape or size. Please call 800-423-7492 or Email westwindgraphics@aol.com for a QUOTE. Affordable high quality floor decals that are slip resistant, super adhesive, temporary, removable decals for asphalt, concrete and floors. Our concrete decals are the first truly affordable full color decals on the market for concrete, floors, gymnasiums, and asphalt! set by ASTM, OSHA, ADA & UL. 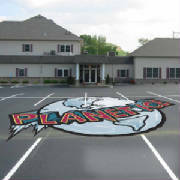 Durability and Storage - Our asphalt decals are designed for short-term outdoor applications and smooth surfaces. They will last up to 2 weeks during moderate temperatures (40ºF - 120ºF). Cracking and edge lifting may occur during extreme temperature changes or exposure to freezing. Our asphalt decals designed for pedestrian traffic only. This product has a shelf life of 24 months. It is recommended to store our asphalt decals in closed packaging at temperatures of 60ºF - 85ºF (15ºC - 30ºC) and a humidity range of 45% - 60%. * A series of footprints guiding customers to new products. * Advertising in the aisles of supermarkets. * Your basketball team's logo on your home court.